"APR’s ‘The Russian Piano Tradition’ offers an invaluable artist-led insight into the work of major pianists in Russia’s golden musical past, a time when communicative warmth, backed by both a formidable command and the richest tonal resource, took precedence over all else….And so it is with both Flier (1912-77) and Igumnov (1873-1948), figures who may not have achieved the cult status of Richter and Gilels outside their native Russia but who exhibited all the qualities one expects from this grandest of Romantic traditions." 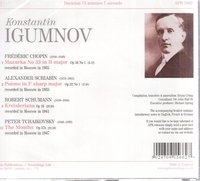 "Though less well known than the first of our great Russian pedagogues (Heinrich Neuhaus on APR5560), Konstantin Igumnov had an equally illustrious career as pianist and teacher. An exact contemporary of Rachmaninov, he studied with the same teachers and the two were good friends, Igumnov championed much contemporary music by his Russian compatriots and gave the premiers of Rachmaninov's first piano sonata and Glazunov's first piano concerto to name but two examples. He taught from an early age and was appointed to the Moscow Conservatoire in 1899 where he remained until his death in 1948; between 1924 and 1929 he was appointed principal. Among his over 600 pupils were Alexandrov, Oborin, Flier, Davidovich, Tamarkina and Grinberg. Sadly he recorded very little and what there is comes from near the end of his life. A live recital taped the year before his death, when he was suffering from flu, does not do him justice and is not represented here, but much of the rest of his recorded output is included and reveals him to be a true romantic whose playing is passionate and focused on the singing line but perhaps larger in scale than the Neuhaus style. Few of his recordings have ever been easily available and this CD fills an important gap in the history of Russian pianism."